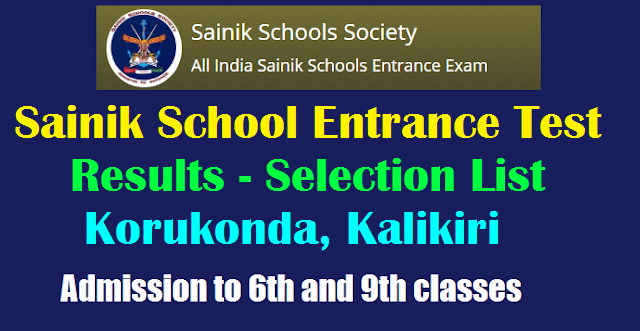 Sainik School Entrance Test Result 2019 : Sainik School Korukonda, Kalikiri Written Results Of All India Sainik Schools Entrance Examination Held On 06 Jan 2019. Sainik School Declares Result For Entrance Exam Conducted In January The result for All India Sainik School Entrance Examination (AISSEE) 2019 has been released. The result is available on the respective Sainik School official websites. The result for All India Sainik School Entrance Examination (AISSEE) 2019 has been released. The result is available on the respective Sainik School official websites. Sainik Schools conduct entrance examinations for admission to class 6 and class 9. Students who appeared for the entrance examination can check their result on the Sainik School website to which they have applied for admission. Students who has qualified in the entrance examination will now go through medical examination and subject to satisfactory performance in the medical test will be admitted to class 6 or class 9. The following is the list of Roll Numbers of candidates who qualified and have been shortlisted on the basis of Written Examination held on 06 JAN 2019 for admission to Class VI and Class IX in Sainik School Korukonda. They will be required to appear for Medical Examination at a later date intimated through call up letters by post. Medical Examinations are likely to be held from 11 Feb 2019 onwards. Candidates not in receipt of call letters for medical examination by 10 Feb 2019 should contact school on telephone No. 08922 - 246119, 246168. Note: The school does not patronise any coaching institute / agent and the admission will be strictly in accordance with the merit of the candidate based on the marks scored in the Entrance Examination, subject to medical fitness, approved by competent Medical Board. The result is also available on the school website www.korukonasainikschool.com. The following is the list of Roll Numbers of qualified candidates in All India Sainik School Entrance Examination held on 06 Jan 19 for admission to classes VI and IX in Sainik School Kalikiri. The candidates bearing the following roll numbers will be required to appear for document verification followed by medical examination at later date as per the schedule uploaded in the school website. The same will be intimated through call up letters by registered post. Document verification and medical examination are likely to be held from 11 Feb 19 onwards. Candidates not in receipt of call up letter by 09 Feb 19 should contact the school on 0877-2500270. The school will not be held responsible for any postal delay/printing errors in the newspapers. The results held with the school will be final and binding. The roll numbers are serially arranged and not as per merit. The result is also available on the school website www.kalikirisainikschool.com. How to check AISSEE 2019 Results ? Step 2: Select and Click of your AISSEE region link. Step 3: Click on the AISSEE 2019 Results link. Step 4: A pdf result sheet will be opened. Step5: Download and check for your roll number in the pdf. The Sainik School entrance examination was conducted on January 6, 2019 at centres across India. The pdf released has category-wise roll numbers of the students who have qualified in the entrance test.